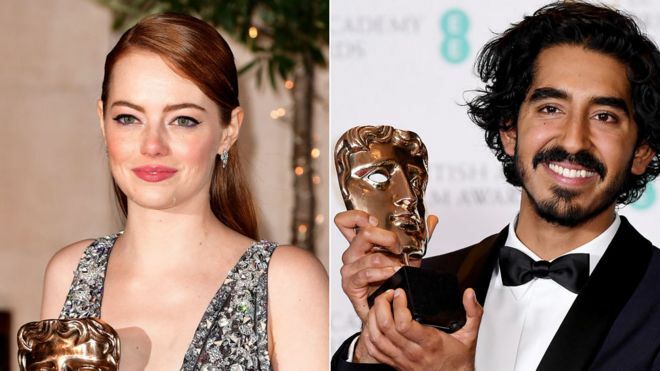 La La Land has dominated the Baftas, taking five trophies - including best film and best actress for Emma Stone, BBC reports. Patel said the win was "overwhelming". She is also nominated for an Oscar for her role in Fences, based on the August Wilson stage play of the same name. Manchester by the Sea also won the best original screenplay, for the text by its director Kenneth Lonergan. You may well be tired of hearing about La La Land, but its winning streak shows no signs of slowing down. The recognition by Bafta is a good sign for the musical - also starring Ryan Gosling - coming just weeks before the Oscars. It had been nominated for 11 Baftas in all and is in contention for 14 Academy Awards. La La Land has already smashed the record for the most Golden Globes, winning seven prizes last month.